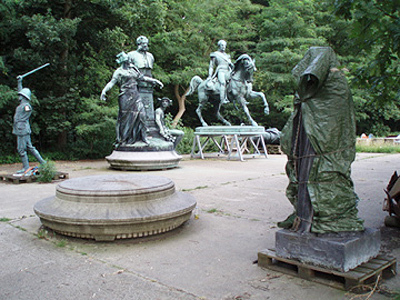 The Middelheim pieces resulted from a longterm research project at the Middleheim sculpture park in Antwerp, Belgium initiated by the artist Paul Hendrikse. He invited Nikolaus Gansterer (visual & sound artist), Alfonso Lingis (philosopher), Lilia Mestre (choreographer) and Martin Nachbar (performer) to transform the entire collection of the sculpture park into a unique performance, called "The Last Acquisition", which took place in early September 2007. Based on the expierences and the impact of the performance the radio play and sound piece "The Middelheim Interviews - An Inverted Park" (2008) by Nikolaus Gansterer and Paul Hendrikse, debates the incidents around the fictitious closure of the Middelheim Museum, which was the first open-air sculpture museum of Europe in Antwerp. 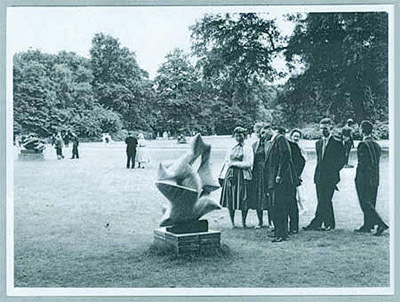 The Belgian sculpture park that opened its doors in 1951 was abruptly closed down in the early Nineties. Prior to this a performance called "The Last Acquisition" took place that translated the museums entire collection into one single work. This performance is seen as the first step towards the closure of the Middelheim Museum. Visitors are invited to follow the acoustic trail of a journalist on her quest to discover what caused the parks' decay. By listening to a series of interviews with eyewitnesses the controversial history of this sculpture park unfolds. What has happened to this once so important museum, what was thereal reason behind the closure of its gates? Can we preserve the memory of a culture that has gone lost, and, if so, how far would we go to re-establish what is left of it? 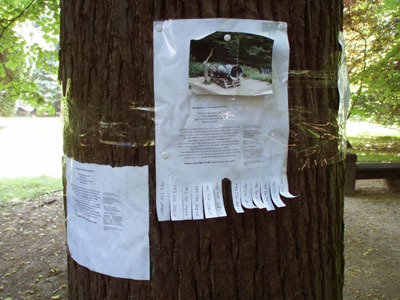 In 2008 the radio piece was again reworked and presented at the Jacobipark in the sculpture park of the Kuenstlerverein Malkasten in Düsseldorf as a contribution (in form of a telephone dialup sound piece) to the openair exhibition Parcours interdit II. 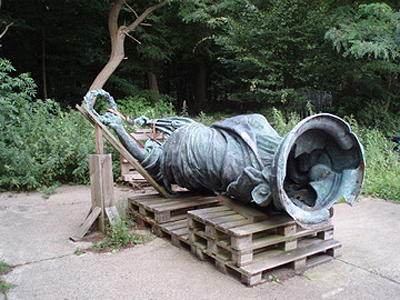 Your piece for Kunstradio is inspired by a specific museum in Belgium: The Middelheim Museum, close to Antwerp. 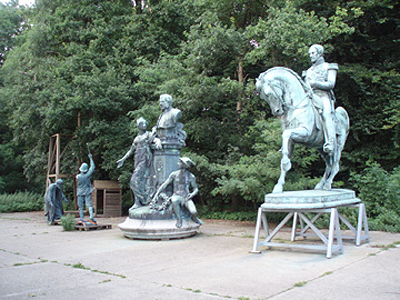 It is an open air sculpture park with which you and other artists engaged in a performance called “The Last Acqusition”. Yes. “The Last Acquisition” started from a couple of works that I did, where I translated a work that already existed into another work, or another parameter. After a while, I thought to give myself the task of translating a group of works into one piece. I started thinking about Middelheim, because I always found it a very interesting but problematic museum and I knew it quite well. The main idea was to bring a collection back into one piece, to summarize everything or compress everything into one single work – which is an obvious impossibility. But that was the job. I do not consider it impossible. I believe in it. I “believe” in it as well, but if you think about it: how would you translate history, politics etc., starting from around 1900 – the time in which the earliest works in the collection were made. There are a lot of connotations and historical facts to compress. I think you have to take the sentence, which is in your radio piece, “The truth doesn’t exist”, as a motto. You cannot possibly understand or grasp or capture everything, so you’ve got to deal with what’s close to you. There is no objective history. That was what the piece was about, that there is not one angle. That it is a farce, not real. Then you had the idea to create a fake radio program: In “The Middelheim Interviews” you assume that in 2018 a radio journalist researches the incidents around the closure of the Middelheim Museum. The performance in Middelheim compressed the museum's collection by making one work from it. I wanted it to be a performance so that the park would be embodied, the performer could walk out of the museum and free the museum from it's premises. In the radiopiece I speculate on the fact that the museum lost it's relevance after that, since the museum got “doubled”, the city decided that it could close. We did the performance in autumn 2007, in the radiowork I shifted the times. The story starts in 1991 when there is a change of politics in Antwerp. A lot of facts in the radiowork are correct or based on reality, but fictionalized and shifted some years. We also altered the names of the protagonists. For example, the main performer who was in “The Last Acquisition”, Martin Nachbar, a German dancer and choreographer, became Hermann Nachbar. We had the idea to be really close to reality but then to have this one step besides, like a parallel line. Exactly, it is a fiction that is as much as possible constructed on reality. It goes along the lines of what actually happened. You also pursue this formally, with small tricks you employ: for example you took out the breath of the journalist in the beginning of the piece. And towards the end there is a sequence where the French guy is repeating his sentence because of a slip. For the listeners these tricks are slightly distracting, like frictions between reality and fiction. We found it interesting to play with this moment when reality becomes construction or construction becomes reality. In a way, especially soundwise, we considered it like curtains: there are curtains hanging behind the text, or at times in front of the text. They create a reality but there is always a friction there. Sometimes the soundscape is enlarged, a bit ridiculous, a bit overstated. There are frictions in the soundpiece. Sometimes the sound fits, the moment after you fall through this reality, into fiction, the same happens in the text. We decided to work mainly with acoustic material not from the park. We wanted that the construction sounds even more constructed. 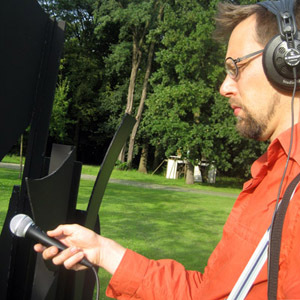 I have done a lot of recordings in the park, empty and with people, and even of the sculptures, how they sound. But in the end we decided really to shift it from reality. We ended up using the sound archive of ORF in order to replace the authentic sounds with archival ones. In terms of acoustics it has hardly anything to do with the park itself. I find that important because for me the piece becomes a blueprint, almost like a model or an example what could happen to visual arts in the future. In that sense, it is not necessary to be related acoustically to the soundscape of the park. It is more about the sound of all these little events that caused to disappearance of the Park, according to our story. What we found interesting was to use this canned sound, like canned laughter for example – a sound that rings a bell, that you have heard before, perhaps a thousand times. And the same canned sound is being used over and over again. The contents of these sound archives are constantly being brought out there. It is another way of construction: these are the building blocks of our story. All the elements of reality are there, but they do not sum up to the real reality because they are all filtered, or a little bit, one step aside of it. Another element slightly outside of reality is the character of the journalist, who in the beginning is in this awkward situation that she can’t get hold of the information she needs, people tell her not to be curious. Eventually she goes through an emotional development – from distanced reporter to manic investigator. She starts off very BBC-like. I listened to a lot of BBC programs when writing the text. I found it interesting to study the way the BBC brings information. The BBC communication is so real to us. And when you listen to it over and over it becomes such a construction as well. The journalist develops from objective to someone who actually loses her objectivity and role. Everybody is playing a role and she loses it. Again, I found that friction interesting, because this development is something you would never encounter in a real documentary. This is also where you see that the construction comes in. At the moment she shifts, the story comes to the surface: you start seeing why this is told, you start perceiving different levels and ways of reading it. A premise of the piece is that art works or museums are keepers of art works which are products of our culture have to be preserved for future generations. Did you want to comment on this critically? How would we deal with the fact if all museums, the products of our culture would just vanish? In Western Europe we are conditioned to preserve everything. Further, we find tourism important, or at least we make money with it – so, there is a lot of concern about preserving things. What would happen with our identity if the culture we are conditioned by would disappear? Would we get an identity crisis? Would it destabilize us? What the piece says, is that maybe you shouldn’t trust in or put too much emphasis on these museums, because you are also the preserver of heritage, you are culture.